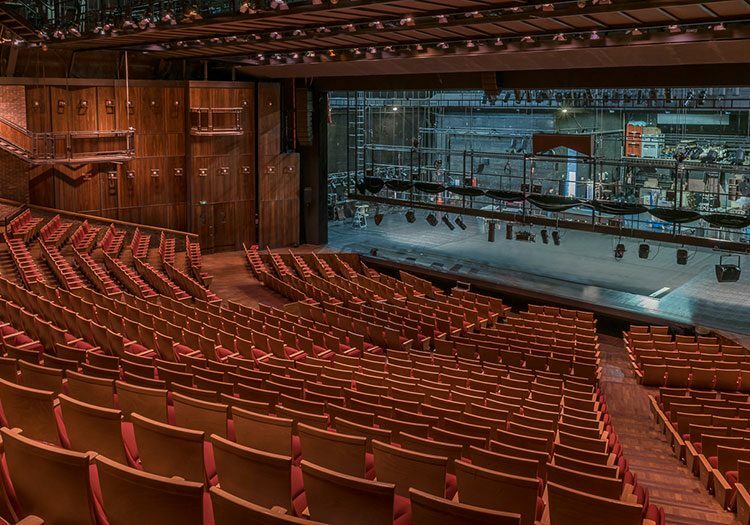 Designed on the principle of an insulated staging area, Le Grand T stands out due to the short distance between the stage and the last row, creating an intimate feeling between the actors and the audience. To enhance this proximity, Le Grand T recently decided to upgrade the entire front-fill sound system. French integrator, Sonowest, trusted APG, a French manufacturer of high-quality professional loudspeakers, and its new Uniline Compact to answer the drastic and complex technical requirements and specifications. The Uniline Compact uses three different acoustic modes: a “large bandwidth” mode (UC206N / UC206W speakers only) for voice and musical reproduction at moderate levels, an “extended” mode (UC206N / W coupled with a UC115B bass speaker or another APG subwoofer) for music applications, and a full mode (a combination of UC206N, UC206W, UC115B and APG subwoofer) for high power applications across the entire audio spectrum. The extended modularity of the Uniline Compact system allows for a large number of configurations (hung or floored) and an almost unlimited number of combinations between these three speakers, so the system can adapt to the different to the specificities of each venue. A total of 14x UC206N medium / long range loudspeakers and four UC115B bass speakers now create a stunning sound at Le Grand T. These are complimented with five UC206Ws for the middle configuration. Finally, four Uniline SB118 bass speakers situated on the floor ensure the sub frequencies. The Uniline Compact range stands out from the competition as it is the only speaker capable of guaranteeing two distinct horizontal directivities: 70° for the N version and 105° for the W version. At Le Grand T, the audio kit is made of 70 ° enclosures, so that sound doesn’t “spill” on the side walls, and sound reflections are minimised. The middle configuration is made of UC206W loudspeakers (105 ° opening) for efficient beams crossing. The challenge with this upgrade was to obtain an even acoustic pressure for the entire audience and a more precise sound with a system capable of handling various user modes. Because Le Grand T mostly hosts theatrical performances, the aim was to find a solution able to preserve the stage frame while reducing the visibility of the speakers to a minimum. Indeed, these are usually considered by directors, choreographers, and scenographers alike as bulky elements that disrupt the artistic approach. 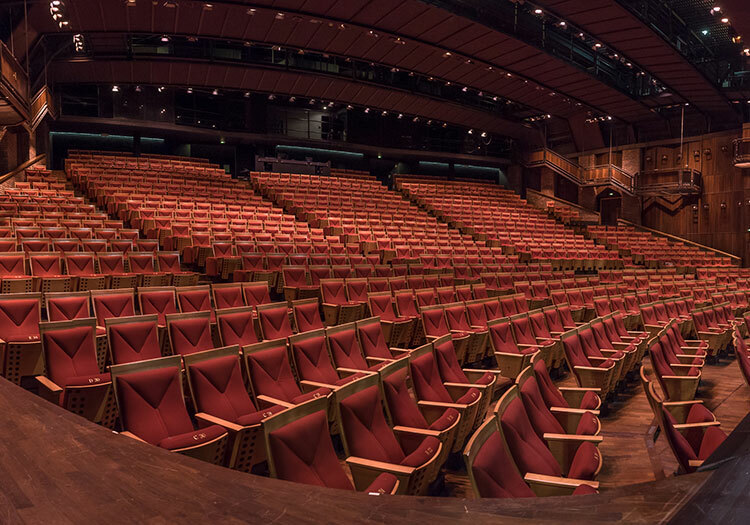 Efficiently integrating a sustainable front-fill system was therefore essential for the audience sitting in the front rows as well as those in the following rows whose sound experience suffered from the dropping sound. In order to ensure those specific requirements were met, Le Grand T reached out to a number of loudspeaker manufacturers to assess the different options and techniques available. A first selection was carried out based on a technical brief coupled with a cost study, highlighting four integrators with four different technical solutions. This was followed by a four-day listening phase allowing the pre-selected brands to each demonstrate their system. These days were organised with a strict framework and timing in order to obtain a written analysis which would result in a fully documented comparative result. Acoustic pressure measurements were organised each day in various spots in the theatre to get the most objective data. After a dozen shows and over 50 performances, including a jazz concert, two plays and a dance performance with live musicians, everyone is delighted with the result and performance of the audio system. Two things particularly stand out: The integrated front-fill is very consistent, a feat that is extremely difficult to get right in theatre venues, and even pressure throughout the entire audience, regardless of where they seat in the theatre.